Place the chicken in the slow cooker. Push the orange shells into the cavity of the chicken. Using a fork, whisk the maple syrup and mustard into the orange zest and juice. Season and pour the glaze over the bird, allowing it to run down the sides. 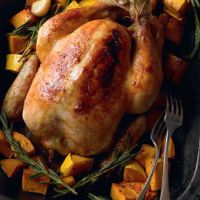 Tip the defrosted squash around the chicken and push the garlic and rosemary in between the gaps. Cover with the lid and cook on high for 6 hours, or until piping hot and the juices run clear when tested with a skewer. Lift the chicken onto a board and remove the squash with a slotted spoon. Skim and discard the fat from the surface of the cooking juices, then pour the juices into a jug, discarding the rosemary. Mash the squash. Remove and discard the chicken skin, then joint the chicken and serve with the cooking juices spooned over, the squash mash and steamed, shredded Savoy cabbage.